You get a handful of energy-saving features to complement stellar washing performance. 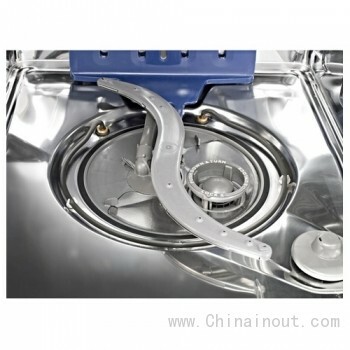 This dishwasher only has two spray arms – bottom and middle. 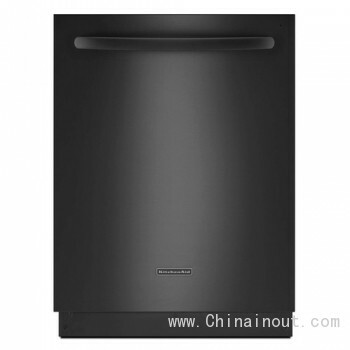 This KitchenAid Architect Series II dishwasher is the best in our comparison. 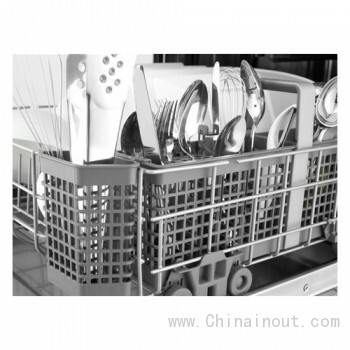 It has all the features you need to clean even heavily soiled dishes, and it’s whisper quiet and very energy efficient. The six wash cycles that you get with this KitchenAid dishwasher are one-hour wash, heavy duty, light, normal, ProWash and a rinse-only cycle. 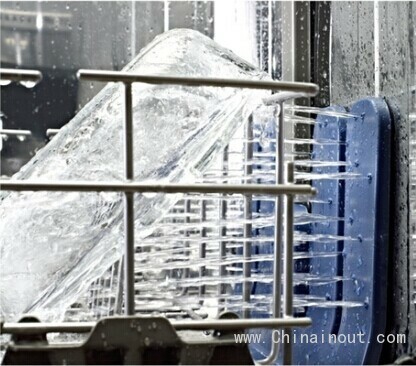 Additionally, the six wash options are delayed start, high-temperature wash, ProDry, ProScrub, SaniRinse and top rack only. However, not all the wash options can be selected alongside every wash cycle. 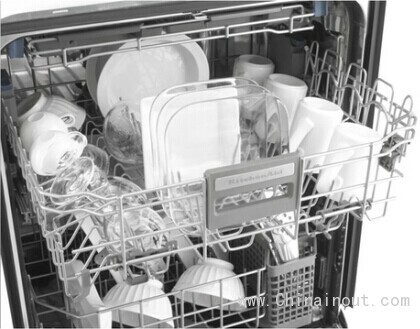 This dishwasher’s ProDry, ProWash and ProScrub functions are some of our favorite features on the appliance. ProDry uses both a fan and the heating element to dry the dishes, which is more energy efficient than the normal dry cycle because the heating element isn’t doing all the work. The ProWash cycle can automatically determine which wash cycle is necessary for the dishes you have in the load. 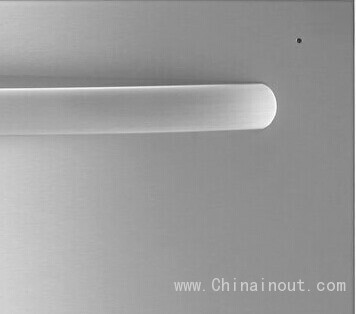 The ProScrub option uses every spray jet, 40 in all, to clean heavily soiled dishes, eliminating the necessity for pre-soaking and scrubbing your dishes before you put them in the dishwasher. 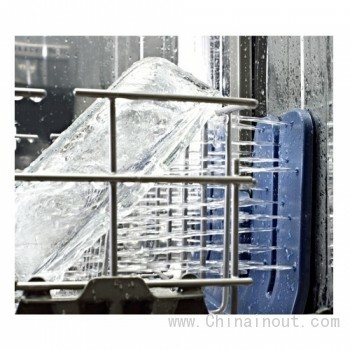 The SaniRinse option is NSF certified, which means it provides a high level of sanitization by using high-temperature wash and rinse water between 105 degrees and 155 degrees Fahrenheit. 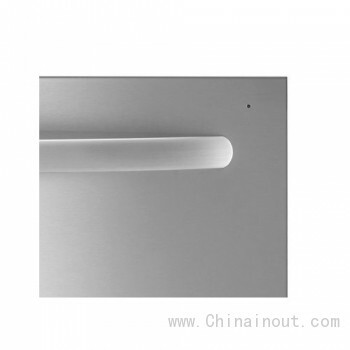 However, this wash option can only be selected with the heavy duty and the normal wash cycles. This KitchenAid includes a few conveniences like the one-hour wash cycle, delay start option and the top-rack-only wash option. The ProWash, ProDry and ProScrub options are also excellent convenience features. With the eco-friendly ProWash, ProDry and air-dry features, it's no surprise that this dishwasher bears the Energy Star qualified label. All of these eco-friendly functions allow the appliance to use less energy and will save you money. According to the included EnergyGuide, this KitchenAid dishwasher will cost you an estimated $33 annually and will only consume 279 kilowatt-hours. This KitchenAid built-in dishwasher is backed by a one-year warranty for its parts and any labor. Additionally, KitchenAid provides lengthier warranties for other parts of the unit. The unit’s racks and electronic components are backed by a five-year warranty, and its tub and door liner are covered by a lifetime warranty. Getting support from KitchenAid, warranty related or technical assistance, is simple. You can contact a service representative by phone, email and even by its live chat on its website. However, if you want email support, you must fill out an online contact form and they will contact you via email. You can also reference FAQs, the user manual and product tutorials on its website for your convenience. The KitchenAid Architect Series II KUDE70FX is the top-rated dishwasher in our comparison. It features a handful of eco-friendly functions including its ProDry and ProScrub options and its ProWash cycle, which help get your dishes clean, sanitized and dry without using unnecessary water and energy. Besides being incredibly energy efficient and powerful, this is also the quietest dishwasher in our review.